Local governments usually have ultimate authority over local building codes. Nonetheless, with the exception of a few areas with very unique wind environments (New York City’s urban canyons and Miami’s hurricane-prone beach fronts, for example), most local building codes are built upon one of several standards that vary from one country to another. 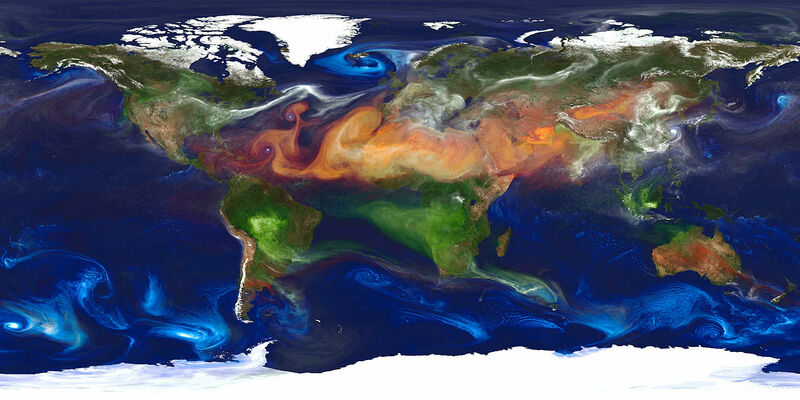 As this portrait of global aerosols above shows, overall wind patterns are different at different latitudes. These differences are even greater as local effects are taken into account. The American Society of Civil Engineers (ASCE) Structural Engineering Institute (SEI) publishes Minimum Design Loads for Buildings and Other Structures(ASCE/SEI 7-10), which catalogs wind load design methods in Chapter 26. ASCE/SEI 7-10 is the basis for most building codes in the United States. It includes a wind speed map for locations throughout the country. The International Building Code (IBC) is published by the International Code Council and references ASCE/SEI 7 for its wind load provisions. The National Building Code of Canada is published by Canada’s National Research Council and is used to calculate wind loads throughout the country. The Eurocode has been adopted throughout the European Union and consists of a central set of procedures augmented by a National Annex for each member state. AS/NZS 1170.2:2011 (Structural design actions – Part 2: Wind actions) is the code used in Australia and New Zealand. Other localized codes include those for India, Hong Kong, China, Taiwan, and Japan. Other wind codes use different wind speeds. For example, Eurocode’s calculations are built around a wind speed averaged for 10 minutes. Using Eurocode’s methods with a wind speed taken from ASCE/SEI 7-10 will yield inaccurate results. Because wind codes are inherently generic, they usually (though not always) predict wind forces that are higher than what is seen in nature, when applied correctly. Wind tunnel testing more accurately characterizes the specific wind-related phenomena of interest to a specific structure and, in many cases, produces lower design loads than calculated using a wind code.